Recently updated, Time Timer® is the ORIGINAL timer to turn the passage of time into something visual and concrete. Turn your smartphone or smartwatch into a fun and easy visual timer. 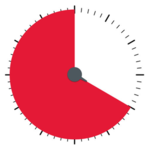 The Timer Timer app features an iconic red disk that disappears as the seconds go by. Perfect for school, work, home or gym. It makes time make sense. This app is a great tool for anyone who could benefit from a visual representation of the abstract concept of increments of time.